So 2018 isn’t even over yet and already I’m feeling pushed to set resolutions and plan my biz strategy for 2019! I get it, BUT can we just have a minute? Wouldn’t it be healthy to take stock of things, before we barrel our way into burn out! 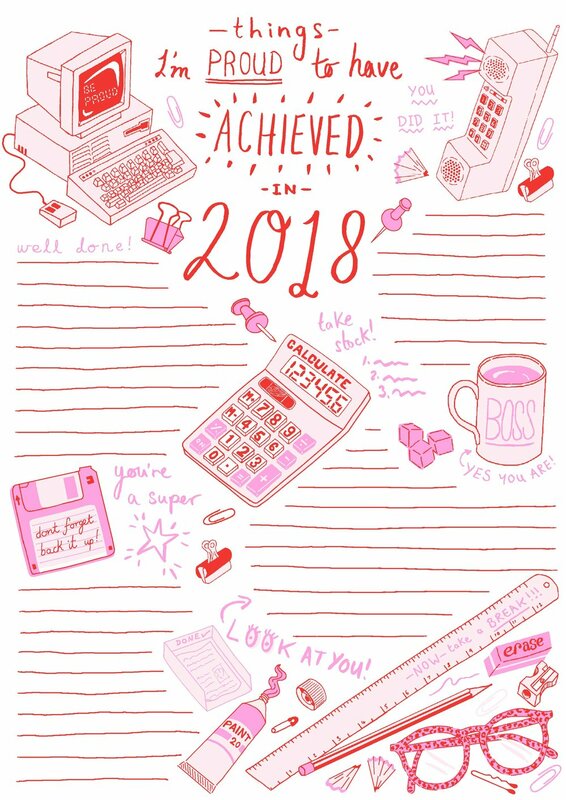 So this morning I counteracted these feelings of overwhelm with an exercise; I wrote down all the things I was proud of achieving in 2018! I had a scroll through my instagram account, to trigger my memory and I wrote down some personal wins too; like upping my gym schedule this year and sticking to it! BOOM! An achievement that balances out my chocolate addiction. Amazing! The final list really cheered me up! Not that I was feeling massively down, but social media can be a constant comparison trap where you feel like you are NEVER DOING ENOUGH! Yet when you write down everything you’ve achieved in a year, suddenly there is a BIG sense of achievement! So I really want you guys to feel this too! Click the image to get the downloadable pdf, print, fill out and let me know if it works for you too, I hope so! Don't be caught out! Print off one of these romantic designs and wow your loved one! Laid out in a ready to print and fold card format, Simply select your paper size and go! Wow August flew by! I had a super fun month as I had Print club London membership so I've been busy making some new screen print editions! I'll be sharing some behind the scenes sneaks of the process soon if you missed my instagram stories! For now here is September's free calendar download, fingers crossed for an extended summer! Summer is officially here and we are already halfway through 2017, I can't quite believe it can you!? Grab yourself this free calendar download to spruce up your desk and keep on top of those dates! Don't forget to share your #deskie on Instagram as I love to regram my favourites! Better late than never! ;) June's calendar is here download, print out and pop it up! It's going up super early this month as I'm going off on my holidays to Japan! Follow along on my adventures on Instagram! Also don't forget to tag me in your calendar snaps on Instagram, I always repost the best! Happy spring everyone it's definitely here! Click the image to Download! Just in the nick of time! Here is a pin up wall calendar for February!! I love seeing what you do with yours so don't forget to share and tag me! This design is inspired by the Beautiful Palm Springs because it's always summer somewhere right? !